The environment must be seen as God’s gift to all people, and the use we make of it entails a shared responsibility for all humanity, especially the poor and future generations. Can we remain indifferent before the problems associated with such realities as climate change... Can we disregard the growing phenomenon of ‘environmental refugees’? Can we remain impassive in the face of actual and potential conflicts involving access to natural resources? All these are issues with a profound impact on the exercise of human rights, such as the right to life, food, health and development. Environmental Justice calls Catholics to a deeper respect for God’s creation, and engages parishes in activities that deal with environmental problems, particularly as they affect the poor and vulnerable. The Office for Catholic Social Justice Ministry supports this shared responsibility by offering programs and creating resources to assist parish communities in their efforts to be good stewards of God’s creation in all its forms. The Office for Catholic Social Justice Ministry is available to help your parish, your school or your organization work toward Environmental Justice! Staff of the Office for Catholic Social Justice Ministry and members of the Environmental Justice Team are available to speak (with DVD or PowerPoint presentations) on connections between respecting life, children’s environmental health problems, and stewardship of the environment in Connecticut, all through the lens of Catholic social teaching. Invite us to come to your parish to share information and dialogue on these important issues! For assistance or more information, call OCSJM at (860)242-5573. The guide includes materials for prayer, reflection and discussion, as well as ideas to help us respond to Pope Francis’ message. 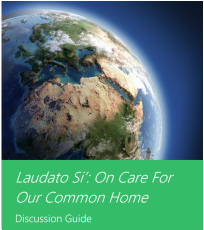 The discussion section of the guide includes quotes and discussion questions on a variety of themes highlighted in Laudato Si’.